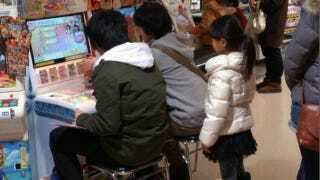 At most arcades in Japan, there's a section for kids. The kiddy games are often card (or plastic puck) based. There are kiddy arcade games aimed at little boys and ones aimed at little girls. Sounds like these two clowns didn't get the message. This photo was snapped at a Sega arcade in Japan. Two dudes sit at a frilly cabinet for kiddy game Aikatsu!, a card-based magical girl title. Behind them, a little girl is forced to wait for them to finish. The image has been retweeted over 20,000 times. "Okay, this is scary," wrote one commenter on 2ch, Japan's largest web forum. "Yep, this ain't right," added another. "Look, there's nothing wrong with playing per usual after you've paid, right?!" said yet another commenter. "Still, this is creepy." Remember! If you venture into arcades, there are some games for adults that you should play. There are other games you might want to play, but don't. Unless there isn't line. Then play all the magical girl games you want.